Escape to a Uniform themed fancy dress party with this great Prison Shirt! Flee officers of the law with this fun Prison Shirt accessory, perfect for Uniform themed fancy dress occasions. This great outfit includes Shirt. The black polo style shirt is in a short sleeved design with a button on the collar for optional use. There is also a pocket to the left side of the chest, just underneath the orange printed detail. This says ‘789431’ which acts as a Prisoner ID. 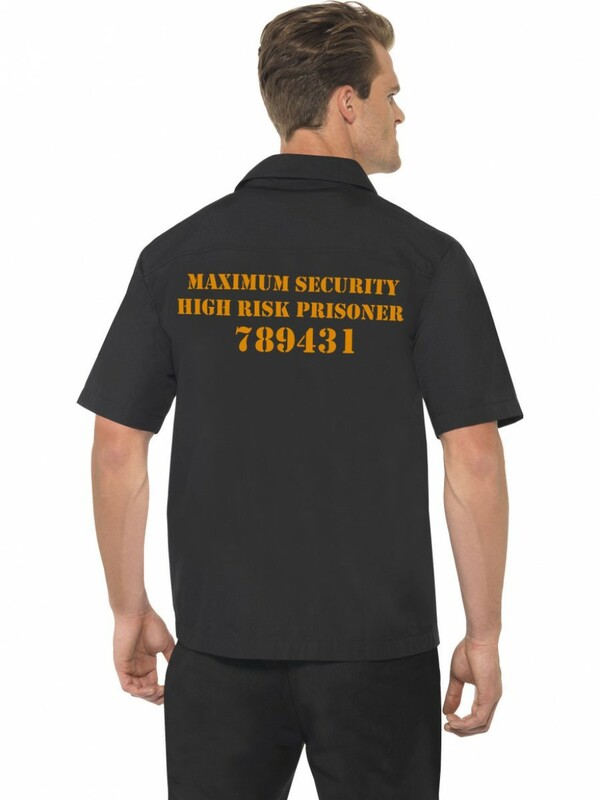 On the reverse of the top is ‘MAXIMUM SECURITY HIGH RISK PRISONER 789431’ again; also printed in the vibrant orange colour, this Prison Shirt is a great-value choice for a Uniform themed fancy dress occasion!